Thanks to the thousands of former players who completed our First Health and Wellness Questionnaire (Q1), we are gaining a clearer picture of your health. 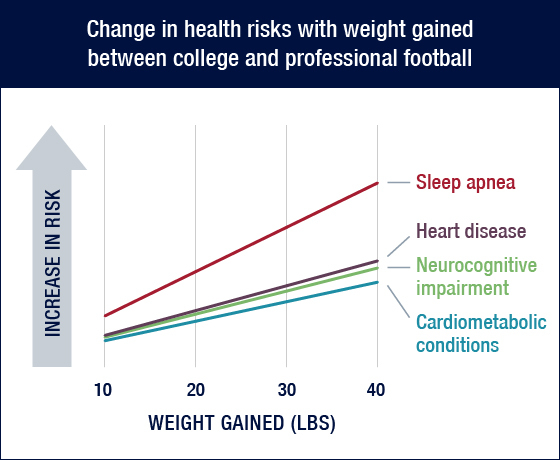 Below are early research results on the potential consequences of football-related weight gain, along with action steps you and your peers might take to be proactive about your health. Former players gained an average of 40 lbs. 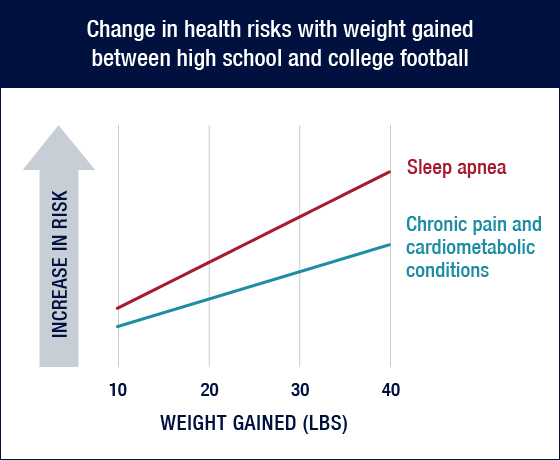 between high school football and present day, with the majority of weight gained during the football playing years. *Heart disease refers to heart attack, stroke, or heart surgery, while cardiometabolic conditions represents high cholesterol, blood pressure, or blood sugar. Neurocognitive impairment refers to a diagnosis of dementia or memory loss. While past research has demonstrated the consequences of post-career weight gain, this is the first study to show that play-related weight gain may be harmful to former players, regardless of the player’s present-day weight. Talk with your doctor about getting a comprehensive work-up that includes assessments of your heart, sleep, brain, and metabolic health. This will help you to identify those areas of your health most in need of attention. Work with your doctor to address any conditions that are treatable. Treating even just one problem, such as sleep apnea, may lead to significant improvements across many areas of your health and better your overall quality of life. Be proactive about managing those areas of health that screenings or your medical history indicate should be a priority for you. Early intervention is one of the best ways to head off problems before they start.